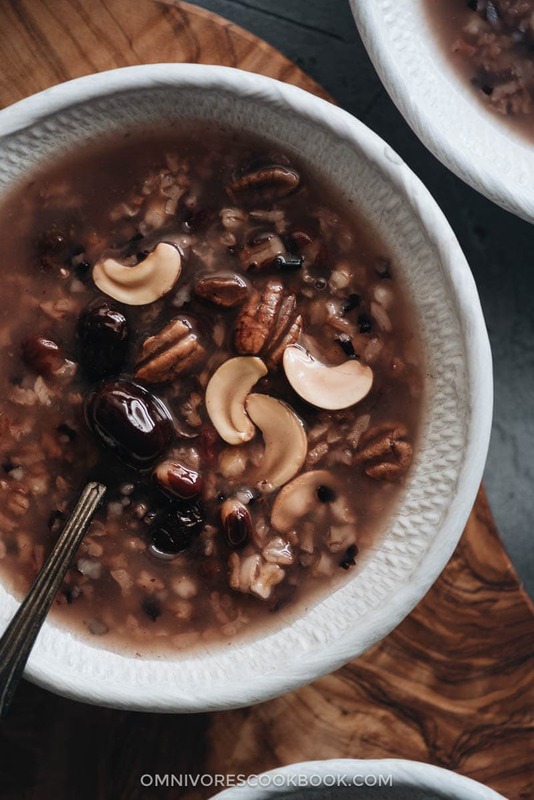 Eight treasure congee is made with whole grains, nuts, and dried fruits. 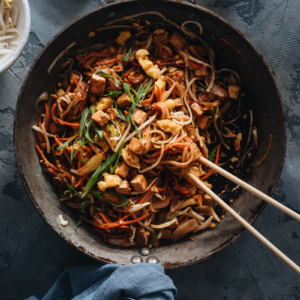 Traditionally served during a Chinese festival, it’s nutritious, comforting, and easy to make. It is a perfect side for a weekday dinner or can be served sweet as a dessert, guilt free. Eight treasure congee (八宝粥), also called Laba congee (腊八粥), is a traditional Chinese dish that is served on the Laba Festival (腊八节). The Laba festival happens on the 8th day of the 12th lunar month and is held to celebrate the enlightenment of the Buddha. 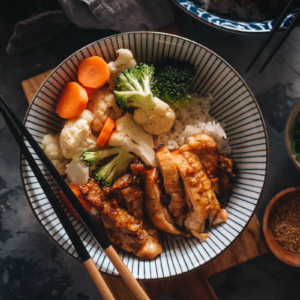 According to Wikipedia, Laba congee dates back to the Han dynasty (206 BC–220 AD) when the congee was used to worship god instead of for consumption by people. When I read about it, I considered myself very lucky that I could cook this dish and serve it for a weekend dinner. As you can guess from its name, eight treasure congee contains eight ingredients. 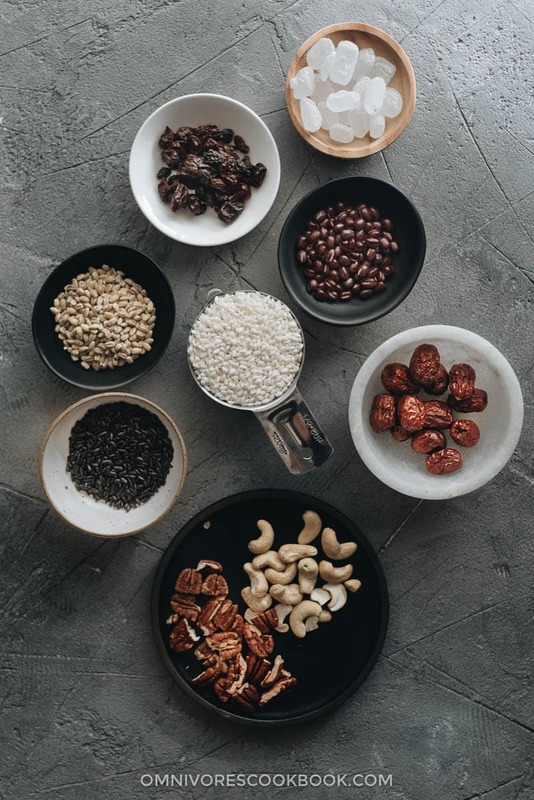 The formula varies depending on each family’s tradition and on available ingredients, but it usually contains glutinous rice and forbidden rice as the main ingredients, along with beans, mixed nuts, and dried fruits. The congee can be served plain, but it tastes best sweetened. In some parts of China, people use ingredients like preserved pork sausage and mushrooms to make the congee savory. 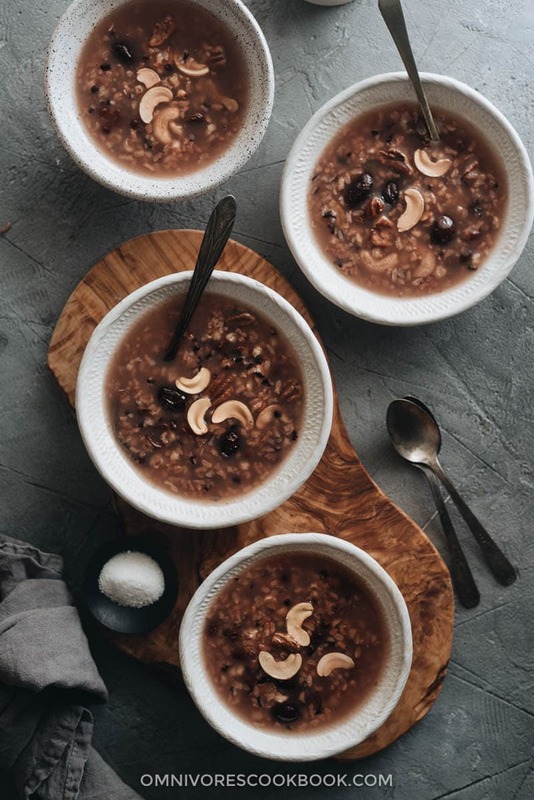 Traditionally, the congee contains a lot of special ingredients such as dried longan, dried lotus seeds, goji berries, and pine nuts. After all, it is meant to be a festival dish that is served on special occasions. However, eight treasure congee is so popular in northern China, where I grew up, that we enjoy it much more often than once a year. Back in the 90s, when most packaged foods hadn’t been imported to China, one of my favorite snacks / light meals was canned eight treasure congee. I would bring it to picnics and drink it on long train rides. It tasted so delicious even when cold, that I considered it a treat. My mom also cooked the congee a lot at home, using common ingredients and often fewer than eight of them. She served it unsweetened as a side for our dinners, along with stir fried green vegetables and braised meat. But I usually added a small spoonful of sugar to make it taste even better. Living in the US, the biggest challenge to cooking eight treasure congee is finding all the ingredients. Some of the ingredients are so special that I couldn’t find very fresh ones, even at an Asian market. 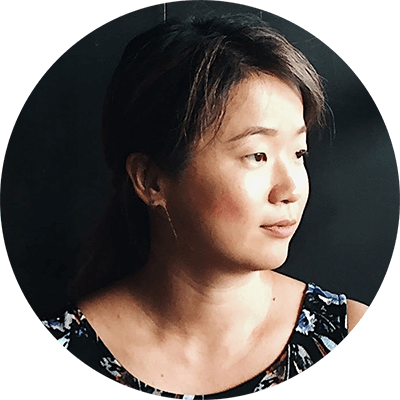 That’s why I decided to develop a flexible recipe that contains more common ingredients without affecting the taste. I also wanted to share the formula so you can blend your own congee. The main ingredient should be glutinous rice and / or forbidden rice. These grains are starchier than regular rice and that gives the congee a smooth and gooey texture. The forbidden rice also adds a beautiful purple color to the dish. The other common grains are brown rice, barley, and corn. I highly recommend adding barley to the blend. This grain gets meaty and crunchy once cooked. Its texture and taste are just lovely. Beans include red beans and mung beans. Some nuts to use include peanuts, cashews, pecans, walnuts, and chestnuts. Other ingredients can be added as well, such as dried Longan, lotus seeds, Chinese dates, raisins, goji berries, and yams. The congee is usually made with grains, nuts, dried fruits, and TCM (traditional Chinese medicine). The ingredients are very flexible. You can use more or fewer ingredients and change them up. As long as you get the majority of it right, the congee will come out well. 3/4 cup of mixed grains: always use glutinous rice and / or forbidden rice as the main ingredients. Mix with other type of grains you prefer, until it fills 3/4 of a cup. Traditionally, all the whole grains, nuts, and beans require pre-soaking, and are then cooked on the stovetop. But if you own an Instant Pot, I highly recommend you use it. Not only you can skip the pre-soaking process and shorten the cooking time, but the congee will also come out with a silkier texture and all the ingredients will be perfectly tender. The eight treasure congee is such a perfect dish during the winter. You’d be surprised at how so few ingredients can produce such a big pot of congee that is so hearty and delicious. Not to mention, it contains so much superfood and nutrition. The congee has a very mildly sweet taste by itself and you can totally serve it plain. But I always sweeten it a little bit to make it extra tasty. It’s one of those dishes I can snack on at midnight and feel no guilt. 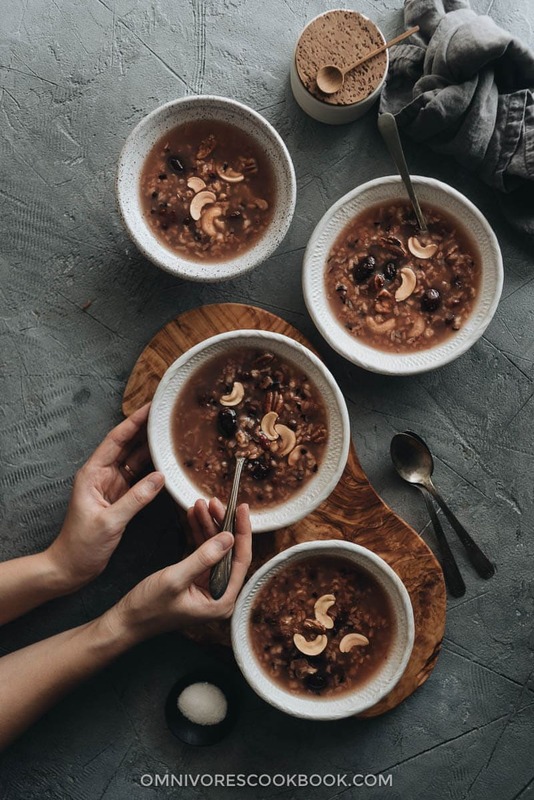 Eight treasure congee is made with whole grains, nuts, and dried fruits. 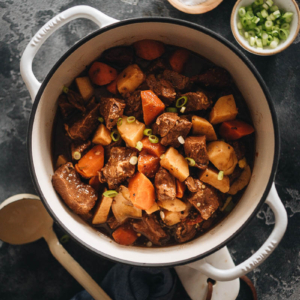 Traditionally served during a Chinese festival, it’s nutritious, comforting, and easy to make. It’s a perfect side for a weekday dinner and it tastes as good as a dessert. Both stovetop and Instant Pot versions are included. Add all the dry ingredients except the sugar, and 8 cups water into the Instant Pot. Set to cook at high pressure for 25 minutes. Once done, release the pressure naturally. (*Footnote 3) Once the pressure is released, stir the congee thoroughly so the texture becomes consistent. (Optional) Add the sugar according to your taste. Stir so that it dissolves completely. If the rock sugar doesn’t dissolve, turn on the saute function and let it cook until the sugar melts, 2 minutes or less. 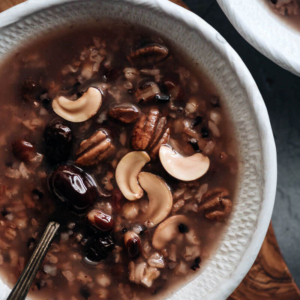 Combine the glutinous rice, black rice, peanuts, walnuts, barley, red beans in a big bowl. Pour in 2”(5cm) tap water to cover. Soak overnight. Discard the soaking water and drain thoroughly before cooking. Combine the soaked rice blend, red dates, and raisins in a big pot. Add 10 cups water. Cook over medium-high heat until bringing to a simmer. Turn to low heat. Cover the pot and leave a finger-wide a gap between the lid and the edge of the pot, to allow more steam to escape and prevent the congee from spilling or boiling over. Simmer until the congee reaches the desired texture, 40 minutes for a thin texture, or up to 60 minutes for a stickier and thicker texture. (Optional) At the end of the cooking, add the sugar and stir to dissolve it completely. It’s hard to measure nuts due to their irregular shape (most Chinese recipes would measure them in grams). I usually use a 1/4 cup and fill it about halfway or up to 2/3 full. I used 10 very small dates and it worked perfectly. If you’re using larger dates, reduce the quantity. Do not use quick release. The congee is very starchy and might clog the valve.